Anne Willan demystified classic French culinary technique for regular people who love food. Her legendary La Varenne Cooking School—in its original location in Paris and later in its longtime home in Burgundy—trained chefs, food writers and home cooks. Under Willan’s cheerful, no-nonsense approach, anyone could learn to truss a chicken, make a béarnaise, or whip up a soufflé. 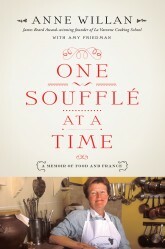 One Soufflé at a Time bubbles with warm, funny, and never-told stories of the world’s most well-known foodies, from Julia Child and her co-author Simone Beck, to James Beard, Richard Olney, Elizabeth David, Jane Grigson and more. Featuring fifty recipes—from Cotriade Normande to Chocolate Snowball—and written in Willan’s open, sharp, fast voice, One Soufflé at a Time is a memoir from a culinary personality who has always defied expections.